Construction Site Accidents Category Archives — Massachusetts Injury Lawyer Blog Published by Boston, Massachusetts Injury Attorneys — Breakstone, White & Gluck, P.C. A new report shares hard numbers for Massachusetts workers. In 2013, 50,000 workers were seriously injured on the job and 48 others were killed in workplace accidents. An estimated 480 workers also died from occupational disease, such as cancer from workplace exposure to hazardous materials. 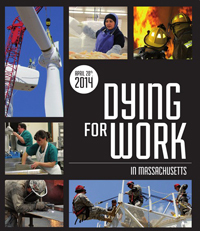 The 2014 “Dying for Work in Massachusetts” report has been released by the Massachusetts Coalition for Occupational Safety and Health (MassCOSH) and the Massachusetts AFL-CIO, which organize the annual Workers’ Safety Memorial Day. 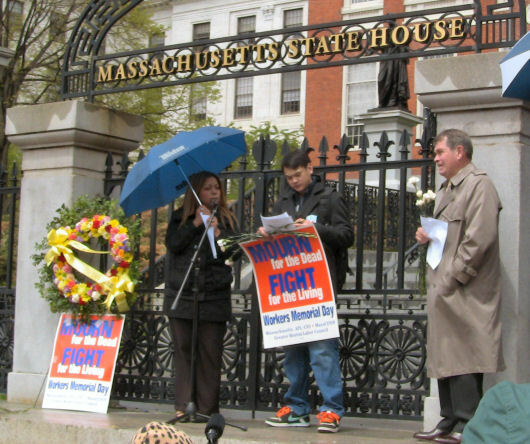 On April 28, workers, families of victims, advocates and state officials gathered at the Massachusetts State House for the 26th annual observance. 48 Workers Killed in 2013. The construction industry remains one of the most dangerous, with 11 workers killed in construction accidents in 2013. Workplace falls killed nine workers, causing one-fifth of all occupational fatalities in Massachusetts. Nine other Massachusetts workers were killed by machines and equipment. Workplace violence took the lives of five more workers, including a teacher, a police officer, a livery driver and two store workers. A new pilot study measures the physical and emotional toll on New England’s construction workers – and researchers say more investigation is needed. 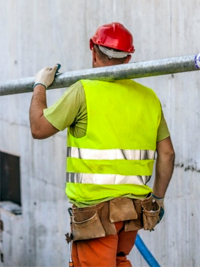 Construction workers face a high risk of physical injury on the job. In 2011, these workers accounted for 12 percent of all workplace deaths in the U.S., according to the Bureau of Labor Statistics (BLS). 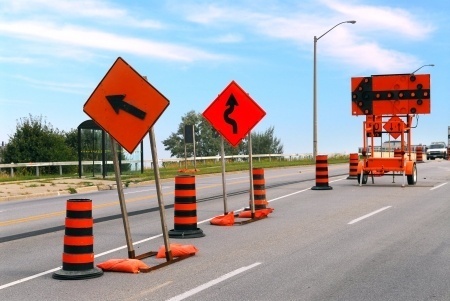 Construction accidents and injuries can happen when employers or construction site managers are negligent in complying with OSHA and other safety regulations, fail to properly staff a job or do not provide the necessary training. The new study from Harvard School of Public Health shows 20 percent of the construction workers surveyed showed signs of being at risk for suicide. 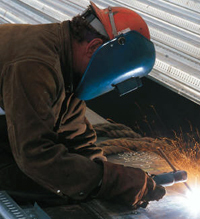 More than 40 percent had suffered one or more workplace injuries in the prior month. The study was published online Oct. 1 in the Journal of Occupational and Environmental Medicine. Researchers say the findings show more detailed studies are needed to provide a better understanding of the high frequency of construction injuries and how they relate to mental distress. Researchers also want to focus on increasing literacy rates among construction workers and preventing suicide and suicide attempts. In August 2012, the researchers surveyed 172 New England construction workers whose average age was 41 years old. They were questioned about psychological distress, depression, anxiety, job satisfaction, musculoskeletal use, injuries and alcohol and tobacco use. Of these workers, 75 percent had experienced musculoskeletal pain over the past three months. In the month prior, 42 percent had reported one or more work injuries. When researchers followed up by phone with workers who fit the criteria for depression, 20 percent showed signs of being at risk for suicide. Some 16 percent reported they were distressed but the majority – nearly 60 percent – had sought no professional help. When proper precautions are not taken, construction workers face numerous risks for physical injury and death. The most common causes are falls, electrocution, being struck by an object and being caught in or between equipment and buildings, according to the BLS. Nearly three out of every five construction workers are killed by one of these causes. Here in Massachusetts, construction workers face the same risks. In 2012, 32 workers died on the job, including six construction workers, according to the Massachusetts Coalition for Occupational Safety and Health (MassCOSH), which reports figures annually each spring. Over the summer, the state saw three tragedies. In August, a tree worker died from burn injuries in Holliston, after coming into contact with live wires. A week earlier, another tree worker suffered serious electrical burns in Chelmsford when he was hit by branches and live wires. In July, a 26-year-old construction worker was killed at a Plymouth construction site when a concrete form collapsed and crushed him beneath wooden frames. MassCOSH is starting to collect new data on other risks to construction and other workers. In its most recent “Dying for Work” publication, it reported 320 Massachusetts workers died from occupational diseases. It estimated asbestos exposure caused over 90 deaths that year. Construction workers struggle with pain, stress from injuries, Harvard School of Public Health. Every year, Massachusetts families and organizations come together to honor the men and women who are killed and injured while on the job. This year, on April 28, the Massachusetts Coalition for Occupational Safety and Health (MassCOSH), the Massachusetts AFL-CIO, and the Greater Boston Labor Council are co-sponsoring Workers’ Memorial Day and are publishing the 2011 report: Dying for Work in Massachusetts: Loss of Life and Limb in Massachusetts Workplaces. “It is critical that Massachusetts employers improve the safety of their workplaces to protect their workers. The high rate of death and injury on the jobsite is still taking a horrible toll on Massachusetts workers and their families. It is also unfortunate that enforcement continues to suffer budget cuts,” said Boston personal injury lawyer David White. The top three causes of fatalities among Massachusetts workers in 2010 were transportation (12 deaths: drivers or workers on roads involved in motor vehicle accidents and plane/helicopter crashes), falls (9 deaths: half being construction site accidents), and commercial fishing (4 deaths). On Workers’ Memorial Day, we honor the fallen by demanding stronger workplace health and safety protections under the Occupational Health & Safety Administration, because it is every person’s right to be safe in their own work environment. Join us on Thursday April 28, 2011 from 12:15 to 1:15 p.m. outside the Massachusetts State House as we mourn for the dead and fight for the living. Breakstone, White & Gluck is a proud sponsorof MassCOSH, an organization with a great reputation for protecting workers and improving workplace safety. Massachusetts workplace accidents and the lives they claim were the focus today at the Workers’ Memorial Day Commemoration and Rally at the Massachusetts State House. The event honored the 62 workers killed on the job in Massachusetts last year. Organizers called for workplace safety improvements to prevent more injuries and deaths. The names of the victims of workplace accidents were read aloud at the beginning of the rally, and a moment of silence honored the men and women, as well as their families. MassCOSH, which co-sponsored today’s rally with the Massachusetts AFL-CIO and the Greater Boston Labor Council, estimated 1,800 Massachusetts workers were diagnosed with cancers caused by workplace exposures last year. Another 50,000 Massachusetts workers reported serious personal injuries. There are currently several efforts to prevent Massachusetts workplace accidents. Last Workers’ Memorial Day, Governor Deval Patrick issued an executive order establishing health and safety committees in all state agencies. 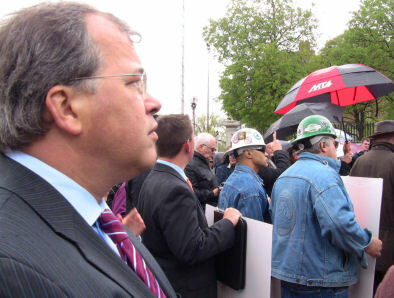 But MassCOSH said a glaring problem that still must be changed is that Massachusetts’ public sector employees are not covered under the federal Occupational Safety and Health Act (OSHA) like private sector workers. Among other recommendations, MassCOSH calls on the state to be more proactive and to protect temporary workers by passing the Employment Agency Bill (Senate Bill 2364). This bill will require employment agencies to provide written notice about key details of job assignments, the work site employer, the type of work to be done, the right to workers’ compensation and other important information. We believe this bill is especially important in light of this economic time. MassCOSH’s complete report is titled, “Dying for Work in Massachusetts: Loss of Life and Limb in Masachusetts Workplaces.” It is available from MassCOSH. Boston attorney David White (below) attended the rally on behalf of the firm. Breakstone, White & Gluck, a Massachusetts workplace accident law firm, supports MassCOSH and its work to improve Massachusetts workplace safety, inspections and enforcement. James Delayo, the former chief crane inspector for New York City, has plead guilty to accepting more than $10,000 in bribes to fake inspections and crane operator licensing test results. Delayo has admitted to accepting bribes between 2002 and 2008 to file paperwork indicating that a Long Island-based crane company had passed inspections that never happened and to say an employee passed a licensing exam never taken. For these and other favors, Delayo received from $200 to $3000 in individual payoffs. An official and employee with the involved Long Island crane company, Nu-Way Crane Service, have plead not guilty to bribery and record tampering. Delayo is currently out on bail until his sentencing on May 4th. His plea deal calls for two to six years in prison. Delayo was arrested back in 2008 after the second of two serious construction accidents caused by massive cranes collapsing. The accidents caused the wrongful deaths of nine people. Authorities said at the time that Delayo’s case was one in a series of cases against builders and inspectors accused of accepting tainted money. Consistent with that claim, Delayo is not the only person in trouble after the 2008 crane collapses. A crane rigging contractor has been charged with manslaughter for one collapse and a crane owner and former mechanic have been charged with manslaughter for the other collapse. Since the 2008 accidents, New York City building officials have made changes to crane training requirements and exam procedures for some operators. Additionally, some inspections are now performed by a national group. To see additional coverage of this story, see this Boston Globe article.